At the time of his signing with the Phillies at the age of 16, backstop Deivi Grullon was one of the top baseball prospects in the Caribbean. Following six years in the minors, the 22-year-old is still looked at as a very promising player. Grullon, who signed for a reported $575,000 in July 2012, looked very good upon making his professional debut with the Gulf Coast League Phillies in 2013, posting a .273 batting average with eight doubles, a home run and 14 RBI in 41 games at the Rookie level. He followed up that campaign with a season in which he split time at three levels in 2014. Grullon started his season in mid-April with Class A Advanced Clearwater out of extended spring training. He notched two hits in ten at bats in two games there. A move to Class A Lakewood, where he would get more playing time, followed. In 24 games as a BlueClaw, Grullon posted a .237 average with five doubles, a home run and seven RBI. Grullon would be demoted once more to short-season Class A Williamsport when their season began in June. With the Crosscutters, he batted .225 with nine doubles, a triple and 18 RBI in 53 games. In 2015 back with Lakewood, the Dominican Republic native tallied a .221 batting average with eight home runs and 50 RBI in 107 games. He closed out his season on a positive note, posting a .301/.370/.470 slash line in 25 August games after struggling at the plate for much of the summer. The following year, Grullon repeated Lakewood, posting a .256 batting average with six home runs and 45 RBI in 87 games. In 2017 he would open his campaign with Clearwater, sporting a .255 average with eight homers and 24 RBI in 71 games there, earning a promotion to Double-A Reading. He did fairly well at the higher level, as Grullon would notch a .229 average with four home runs and 13 RBI in 23 games. Last year, Grullon would spend the full season at Reading, standing out as an All-Star and winning the Eastern League's Home Run Derby, putting some power on display. 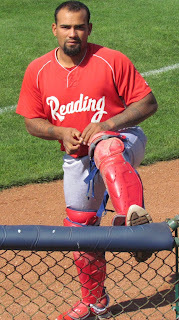 In 90 games for the Fightin Phils, the talented youngster sported a .273 average with a career-high 21 homers and 59 RBI. Grullon went 0-for-16 in eight Dominican League games this off-season before he was removed from the Aguilas' roster. A right-handed batter, Grullon generally hits better against lefties (.969 OPS in 2018) than he does against righties (.778 OPS in 2018). Coaches view Grullon as an all-around strong leader, one of the key qualities for a catcher in the professional ranks. A player that teammates go to for assistance, Grullon is highly valuable to his club. Additionally, the youngster himself is hungry to learn and has improved his English in an effort to better communicate with his pitching staff. With a frame that is well suited for the position, the six-foot-one 180-pounder has excellent tools on defense, is a great receiver and features an extremely strong arm that keeps opposing runners reserved. The upside for Grullon at this stage may be a big league back up catcher, but with the improvements he has made at the plate, he could be pushing for more than that. Expect Grullon to open this year with Triple-A Lehigh Valley. He could be an easy call up this year if the Phils catchers experience any injuries at the top level. You can keep tabs on this year's complete Phillies prospects countdown by clicking this link.